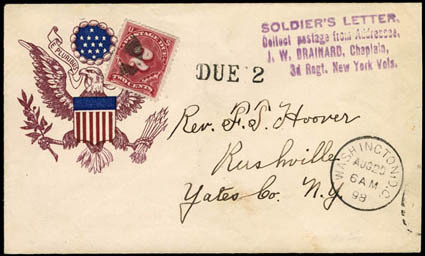 (Spanish American War Patriotic) Eagle and Shield, red blue and purple patriotic design on cover to Rushville N.Y., bold strike of "Soldier's Letter., Collect postage from Addresse, J.W. Brainard, Chaplain, 3d Regt. New York Vols." four-line handstamp, sharp "Washington, D.C. Aug 20 98" cds and matching "DUE 2" handstamp, Rushville (8.20) receiving backstamps; barely reduced at right, fresh and Very Fine. 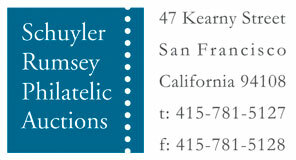 A link back to Sale 75 - Lot 178, along with its description, will be appended to your message.